16 the advertizer Fri 16 Ma r c h Sun 18 Ma r c h Wed 21 Ma r c h Pollokshaws Ceilidh A Ceilidh will be held on Saturday 17th March 2018. The venue is Pollokshaws Burgh Hall, 2025 Pollokshaws Road, G43 1NE, and will take place from 7pm – Midnight (includes one free entry to raffle). Entry Donation £8 and under 16s free, Drinks £3. You can pay online at www.hdscotland.org or by calling Linda on 0141 848 0308. Funds raised will help to improve quality of life to people impacted by a complex neurological condition (HD). Book & Music Fayre Weekend Sat 3rd & Sun 4th March 2018 The ACCORD Store in Paisley will be hosting a book and music fayre selling a whole range of items over the weekend! Opening times are Saturday 10am-4pm and Sunday Midday-4pm, at the Accord Store, 110 Abercorn Street, Paisley, PA3 4AY. This is a free event with a whole range of items over the weekend. Bargains Galore! Selling best sellers, children’s books, biographies and much more! Refreshments available. Comedy with John Archer Friday 20th April 2018 River Inn, Houston PA6 7AW Open to everyone! Freeland Church Men’s Fellowship Group brings us a night of Comedy, Fun, Laughter, Food with John Archer. Comedy, Magic and more... Check him out... www.john-archer. com. Tickets available from 15th February. Tables of 10 - Group bookings - Individual tickets John Archer will give a short testimony after his performance. Tickets from: Robin Livingstone 07765 938909, robinlivingstone@ googlemail.com or Hamish Walker 07748 106322 Astronomy Evening RSPB, Largs Rd, Lochwinnoch 7.30pm to 9pm Discover night sky wonders with a presentation from the Astronomical Society of Glasgow. Outdoors stargazing if weather permits. (Members discount available.) Adults £6, Children £4.80 (RSPB members: £4.80/£3.80) Sa t 17 Ma r c h Kilbarchan Messy Church Kilbarchan Parish Church Hall, Steeple Street 4pm to 6pm All accompanied children welcome. Bishopton Art Group Spring Art and Craft Fair Bishopton Community Centre, Gledstane Road, Bishopton 10am to 3pm A variety of products for sale from local amateur artists and crafts people - an ideal gift for that someone special. Tea, Coffee and delicious home baking will be available. 5-minute walk from Bishopton railway station with ample free car parking. Free Paisley Abbey Recital Paisley Abbey, Abbey close, Paisley 12.30pm Peter Wilson - tenor, accompanied by George McPhee. Cloister Cafe will be open from 10am with baking. .£5 at the door Houston and Killellan Kirk Houston & Killellan Kirk, Main Street, Houston 7pm Coming to Houston for one Night Only - ZUGLO CHURCH CHOIR FROM BUDAPEST. No tickets required. Donations to Kirk Funds. Please support this unique event in our village. Tell you friends and neighbours. Free Ceilidh Pollokshaw Burgh Hall, Glasgow 7pm to midnight A Ceilidh in aid of Scottish Huntington’s Association. At Pollokshaws Burgh Hall, Glasgow from 7pm till midnight. Includes one free entry to the raffle. Entry donation £8 and under 16s free. Drinks £3. Tickets online at www.hdscotland.org or by calling Linda on 0141 848 0308. £8 Lochwinnoch Explorer Group: Birdsong! RSPB, Largs Rd, Lochwinnoch 10am to 12noon Birdsong is one of nature’s simple wonders that many of us enjoy, but it is anything but simple. Have you ever wondered if birds have “accents”? Did you know some birds take up to 30 breaths a second to keep up their melody? Did you know some birds have a record collection of up to 200 songs!? March is a great time of the year to spend a Saturday morning at Lochwinnoch studying the birds and learning about their calls. So come and learn about birdsong and appreciate it in a new way. Please wear suitable clothing for being outdoors. Ages: 5 to 14 years. Please note that all children aged 8 and under must be accompanied by an adult. Booking essential. Cost: £5 (£3 RSPB members) (adults go free) Sa t 17 Ma r - Wed 18 April RYA Powerboat Level 2 Castle Semple Visitor Centre, Lochlip Road, Lochwinnoch 9am to 4pm A comprehensive course to enable you to gain your powerboat licence. Practical on the water activities with overnight homework! COST: £150 for more info look online and book ASAP. Gateway Garden Free Drop In Session Cartside Terrace, Kilbarchan from 2pm Gateway Garden, All welcome to visit for a relaxing time, with the option to join in easy gardening and bird feeding activities and to bring your gardening questions to our experts. Also planned for the day - a Kilbarchan Community Spring Clearing and Hedge Trimming session. Come and help to spruce up the village! Get involved to make a difference to areas you would like to improve the or sign up for a litter pick kit. For more information, contact 07952169341 or hello@kilbarchansmile.co.uk or join the group Kilbarchan Smile on Facebook. Kilmacolm Christian Aid Committee Bread & Cheese Lunch Kidston Hall, High Street, Kilmacolm 12.30pm Everyone is most welcome, we ask only for a small donation in lieu of your Sunday lunch, and in appreciation of delicious homemade soups, tasty bread with a variety of cheeses. and shortbread with tea/coffee. For further information please telephone Jill Russell on 01505 872393. J u n i o r C r o s s C o u n t r y Championships Finlaystone Country Estate - Langbank 1pm to 3pm Join the Rangers for a gentle stroll through the forest with Try our Finlaystone 1k kid’s cross country. Age 4-6, 7-9, 10 and over. Prize in each category for best time. Scone-noisseur Of The World Contest Comes To Lochwinnoch The Cakery, 5 High St Lochwinnoch PA12 4DB The inaugural ‘world championship’ of scone making is coming to Lochwinnoch - 45 minutes to bake the perfect plain scone Entry costs just £10 and forms are available from: loch. bain@btinternet.com or at local shops in the village. The Cakery No 5, which has generously offered its support, and under the supervision of Lochwinnoch SWI. Thomas Coats Memorial Choral Society Concert Paisley Abbey, Abbey close, Paisley 7.30pm (doors open 6.45pm) Ticket£12/£5 students/ accompanied children free. Tickets available at the door or from Choir members phone: 01505 816110 or 01505 612874 Email: coatschoral@btintern.com Mo n 19 Ma r c h Home Safety & First Aid Workshop St Columba’s School, Duchal Rd, Kilmacolm 7pm to 8.30pm Barratt/David Wilson Homes will be holding a number of Home Safety workshops in the area and on Monday 19th March they will be coming to St Columba’s Junior School. The workshops will cover tips and strategies on keeping younger children safe from the dangers that can lurk in the home, together with advice from St Andrews First Aid. There will be two workshops; the first will start at 7pm and the second at 7.45pm. The workshops are open to the community and there are spaces for ten parents at each session; the workshops are free of charge. Spaces are limited so please email marketing@st-columbas.org as soon as possible. Embroiderers’ Guild Bridge of Weir Branch Freeland Church, Main Street, Bridge of Weir 2pm “Tell me a story”. A talk by Margaret Dundas, a talented craftswoman, musician and writer, who better to take us on an adventure? Visitors are very welcome, whatever your textile fascination! For more information contact egallaher@btinternet.com Fri 23 - Sa t 24 Ma r c h Kilmacolm Art Class Annual Exhibition Kilmacolm Community Centre, Lochwinnoch Road, Kilmacolm 10am Over 100 pictures on display in a pleasant environment with the opportunity to buy an original painting by talented artists at a reasonable price. You may even be inspired to consider joining the class, details available at the exhibition. Friday from 10am to 5.30pm and Saturday from 10am until 4pm. £1, children free Sa t 24 Ma r c h Duchal Nursery FREE Easter Egg Hunt Duchal Nursery School - Kilmacolm 10am to 12noon For all under 5’s! All welcome, come along for a morning of Easter fun – crafts and egg hunt. FREE Former Pupils & School Hockey/Rugby Matches St Columba’s School, Duchal Rd, Kilmacolm 9.15am to 12.30pm Astroturf, Gryffe Road, Kilmacolm, PA13 4BA Birkmyre Park, Knockbuckle Road, PA13 4HX The hockey match begins at 9:15am at the Astroturf. Two rugby matches are played: one between two School teams and the second between two former pupil teams. The rugby begins at 10:30am at Birkmyre Park. Please join us for what is sure to be a fun-filled morning. Spring/Easter Window Competition Kilmacolm Library, Lochwinnoch Road, Kilmacolm Kilmacolm Community Council - ‘Best Dressed Shop Window” competition - with a Spring or Easter theme. Included in the display there will be some hidden treasure for children to find! St Columba’s Pipe Band and Angel Voices who will provide entertainment on the plaza outside the library. Please come along and support our village and local businesses. Paisley Abbey Concert Paisley Abbey, Abbey close, Paisley 12.30pm to 2.30pm Guitar Recital by Sacha Salvoni and Marco Ramelli. Tickets available at the door or in advance from Abbey shop. £5 ACCORD Hospice Grand Ball Glasgow Marriott Hotel, 500 Argyle St, Glasgow G3 8RR Three course Harry Potter themed meal, bubbly reception, hosted by Steve McKenna, with entertainment for the MacDonald Brothers. 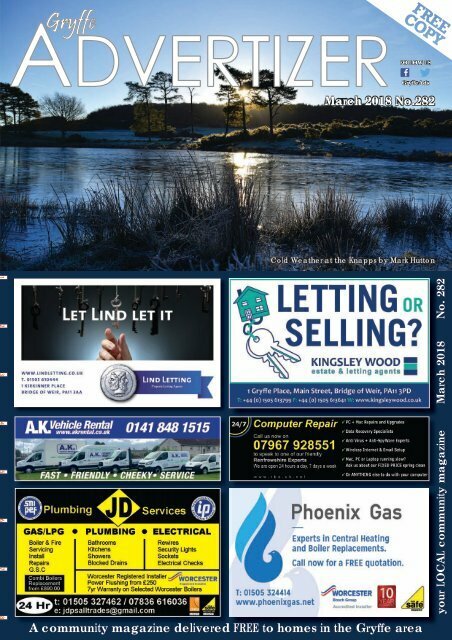 £80 YOUR TICKET TO LOCAL EVENTS /GryffeAds advertizer.co.uk /content/what-s-on 01505 613340 info@advertizer.co.uk deadline date for our april issue - Friday 16th March - You don’t want to miss it! !